This spring at my library, we're exploring both microcosms and macrocosms as part of the newest rotation of the BOOMbox, our flexible STEAM space. Under the heading Big and Small, the space is filled with microscopes, telescopes, and all manner of activities to explore these various cosmos. My coworker Amy had the outstanding idea to move some of the formal programming for this spring outside of the physical library space by offering Stargazer Nights on the Village Green adjacent to the library. All the better to take advantage of the Cometron telescopes the library purchased, Amy reasoned. And to maximize the potential audience for these sessions, Amy asked me if I'd be willing to host one session per month on the night of my usual weekly evening shift while she offered sessions on hers. I was excited to help! So far we've hosted four of our six total Stargazer Nights. While these events appear on our online and print calendars and BOOMbox flyers, they're drop-in events, with no registration required. Despite the fact that we've had 2/4 overcast evenings, we've had several dozen participants each time. And I consider this next bit exciting: through informal conversations with the folks who come to participate, we've found out that about 80% of participants had not come to the library specifically for the event; rather, they serendipitously discovered it was happening on their way into or out of the library. Visibility, here, was a huge factor--folks could see the telescopes pointing upward as they went about their library business, and natural curiosity and wonder induced them to stop and look up, too. Regardless of the visibility on any given evening, each Stargazer Night introduced families and individuals across a wide age spectrum to basic telescope skills and etiquette. We talked about using the finderscope to help to point the telescope at the desired object to view; how the mirrors of the telescope cause what we see through the eyepiece to be inverted; and how to focus the telescope. Amy and I have also discovered an excellent way to help young stargazers use the telescope without bumping it and thus changing the view: we ask kids to put their hands in their pockets before leaning over to look in the eyepiece. Simple! We talked about simple astronomical identification skills such as finding the Big Dipper; using the Big Dipper to locate the North Star; and how to tell a star from a planet from a man-made satellite. We also talked visible constellations, including Orion (we had a great view in March) and Leo (in April). We saw the moon in several different phases over the course of the four Stargazer Nights, and so we had conversations about the phases of the moon and their names as well. The cream of the crop, though, truly was looking through our Cometron telescope to see the moon in sharper relief as well as a few planets. We've been able to see Venus (both with the naked eye and through telescopes), but Jupiter really takes the cake. 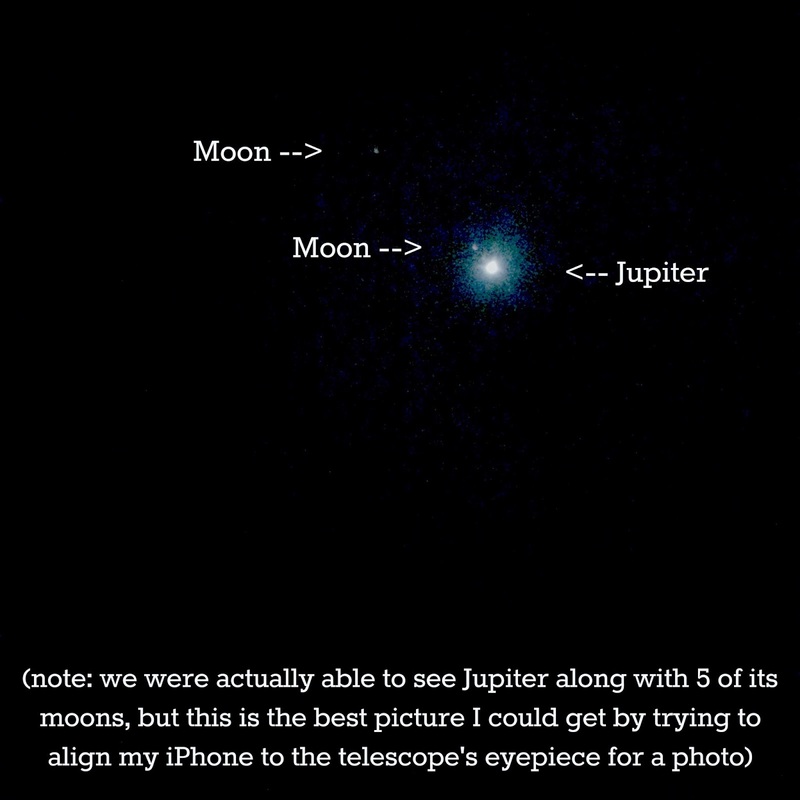 Jupiter is plenty visible without a telescope, but we were also to see a whopping 5 of Jupiter's moons when we viewed the planet through the telescope. 5! So many participants' minds were blown at being able to see such distant celestial bodies. While we have two more Stargazer Nights coming up in May, I must say we've already had some outstanding outcomes. On the most basic level, we've had lots of participants of all ages expressing thanks for being able to even do this sort of thing at the library. We're relatively near Chicago, with its Adler Planetarium, but even so everyone we talked to was thrilled to have this type of opportunity in Skokie. Parents commented that they particularly appreciated being able to expose their children to this type of technology. One family who stumbled upon the event and joined had never even seen a telescope before--what an amazing opportunity for the library to have a significant impact on their scientific knowledge. The programs thus far have engaged a wide range of ages and knowledge levels. We had the aforementioned novices, but we also have had longtime astronomy hobbyists who enjoyed a) participating in something they care deeply about with others, and b) having the opportunity to share their knowledge by answering some questions when Amy and I were helping other folks. The majority of participants fell into some middle ground--they knew a bit about stargazing and/or astronomy, but hadn't been reminded to look up in quite some time. Stargazer Nights resparked their interest. 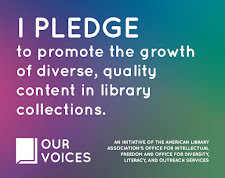 And that's what we ultimately want of any BOOMbox activity: to spur an interest or motivation to engage in a topic beyond the library program itself. To that end, we made sure that anyone who was interested in continuing to stargaze on their own was able to take home the monthly Evening Sky Map we had printed from SkyMaps.com. If we can inspire behavior that leads to further exploration? I consider that a stellar program. 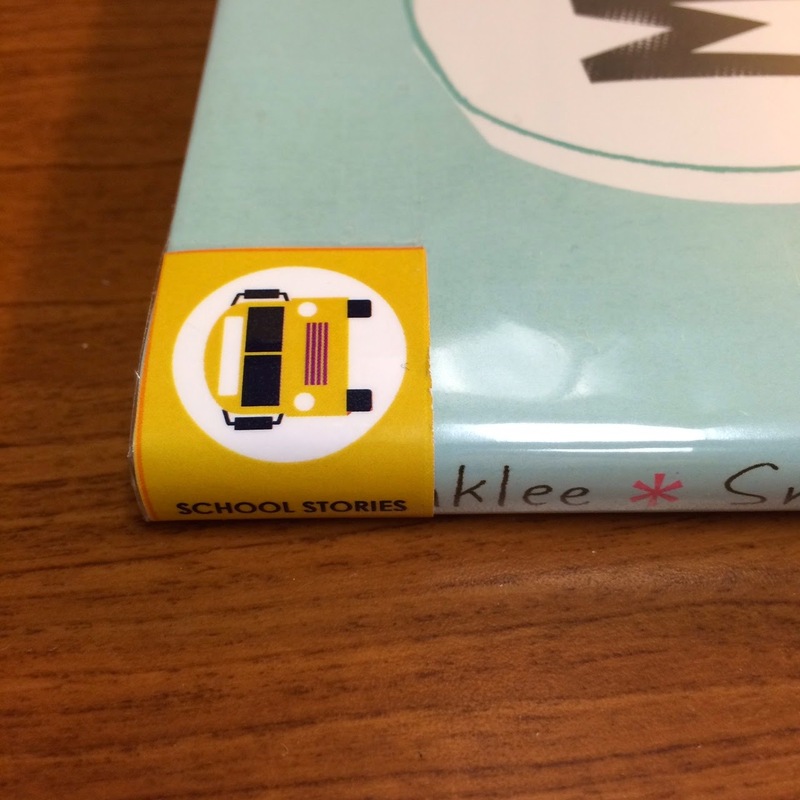 We debuted a new pocket collection at my library this week. Let me take a step back to start. We’ve been redesigning a space in the youth department designated for children ages 4-7, whom we call “Little Learners,” and their caregivers. The goal of the space is to engage these emerging readers and their families in literacy-positive activities, including reading and hands-on learning. One of the initiatives for the space, and the one that I’ve helmed, is the creation of a pocket collection: ten themed browsing bins of age-appropriate picture books (YES! Picture books, and nonfiction in picture book format, are wonderful for all ages!). I’ve done theming/organizing of collections before, but the really cool thing about the Little Learners Browsing Bins project is that it was building a pocket collection from scratch. Turns out it’s super gratifying to go through all the steps to create a shiny, accessible new collection. The first step was deciding on the bin themes. I did some research on libraries that have organized/reorganized their picture book collections into neighborhoods, thinking about what themes recur most and would be most appropriate for ages 4-7. I created a list of about a dozen themes, then shared them in a poll with all the folks at my library who work the youth services desk. My team members were expert at weighing in on themes--they know what types of books families with children this age ask for over and over again, and they have a great sense of what hidden gems in the collection could use more time front-and-center. They voted on preferred themes, including writing in suggestions. A combo of these themes then went to a poll on the library’s Facebook page, which library patrons were able to take. We got some good feedback from the folks who took the public poll, too. Then it was GO TIME for getting books in each theme. With the exception of titles for the Longer Tales and Listen-Along categories, which were culled from our existing collections, the books for the bins were gathered by purchasing brand new copies of great books. I bought one copy of each title for the bins, and the library also owns at least one additional copy of each title housed in our regular stacks. In my purchasing, I prioritized titles that are more recent (think the past few years) as well as titles by, about, and/or featuring diverse persons. Equity is a major goal with this pocket collection. The library’s access department staff were outstanding in cataloging and preparing these items, and our graphic designer made outstanding icons for each of the themes; each book in the Little Learners Browsing Bins collection has a beautiful spine sticker, with both text and icon, to identify its theme and home. Very simple for both customers and staff. There are more elements to the redesigned Little Learners area at my library than these Browsing Bins, including interactive panels, circulating Little Learners backpacks for at-home learning, a rotating monthly display, and eventual hands-on activities for children and caregivers to do together. I like to think, however, that the Little Learners Browsing Bins are a cornerstone of this revamped section--something previously not offered by the library, with great books displayed beautifully and in a manner that pre-readers and emerging readers can use effectively. I so look forward to seeing how this pocket collection is used--and, hopefully, enjoyed--by our 4- to 7-year-olds and their families.